a young man in Kiryat Malachi was called in to the police station and given a restraining order from his wife, who had recently given birth to his first-born son. The fellow wanted to perform the mitzva of pidyon haben, redeeming the firstborn son, but the restraining order presented a problem. As the 30th day approached, the father came up with an idea by which both parents could be at the pidyon haben - by holding the ceremony in the police station. He asked the police chief, who agreed to the idea. The pidyon haben ceremony was held in the shul of the police station. As an aside, the young man, in his excitement and emotional state had forgotten to bring a kippa along, and the police were once again able to come through in a pinch and provide the head covering, in the form of a police cap. I am not a big fan of calling stories "only in Israel", but this really sounds to me like an "Only in Israel" story! 6. what happened to the Iranian threat? 10. not for the reason you might suspect - Rabbi Slifkin explains why he is critical of the haredi community, and it is not because of the ban on his books. We have a prime minister who is impotent, who does not know how ti manage - not with the Palestinians and not with the world. If he "really wants" and it isn't happening - it seems there is a failure in his ability to perform. And if he is making the calls simply as lip service and does not really mean it - how much more so he should not be in this position.. The frum world's approach to new technology is sometimes understandable, but sometimes it is confounding. The latest announcements, and there are two of them specifically, coming out of the frum world regarding technology are more of the latter rather than the former. 1. Some organization, or group of people, in Beitar Ilit has been putting out notices around Beitar announcing that because the plague of the iPhone, Blackberry and other similar items that have been prohibited by the gedolim has been spreading through our camp, so much so that people are even pulling them out in the shteiblach and in other public places, without any shame, they have set up this organization to fight against this breach in any way possible. having people appointed in every shul and beis medrash that will approach any person who brings such a device into the shul and will demand that the person leave. Such people will not get called up to the Torah, they won't be allowed to lead services on the day of a parents yahrtzeit. they will report to the schools which parents are holding these devices, so that "there children will not learn with our children", and they will also publicize which schools do not cooperate with them, against the wishes of the gedolim. The announcement also included a piece about Rav Wosner's psak halacha that anybody with such devices is invalidated from being a witness, and if he were to shecht an animal his shechita would be unacceptable. 2. The hassidic community of Sanz is now making a move against not just new technology, but also old technology. This also comes out of Beitar, specifically the Sanz community of Beitar. Any parent who refuses to sign a commitment to follow the new rules will not be allowed to send their children to the schools. The new rules include a ban on having a computer at home that is not necessary for work purposes or for writing Torah pieces, with no accessibility to the kids protected by a frequently changing password, removing any games and videos form the computer, having absolutely no access to the Internet. To be allowed to use a computer or email for work, whether at home or at work, a person needs to get a letter of approval from the committee. Also, obviously, no cellular phones are allowed at all. Not even the ones that are designated as approved, kosher, phones. Somebody who absolutely needs it, or needs a Blackberry for access to email (and nothing else) can get approval from the committee. Even a land line phone can only be owned if the ability to call inappropriate material is blocked. MP3 and MP4 devices are only allowed to be used if the ability to access radio is disconnected, and even then they cannot be brought into the educational institutions at all. It seems, for some reason, that digital cameras are ok, but the memory cards, usb drives and Disk-On-Keys are all problematic and cannot be used by students. "experience has shown that by involving oneself in these things people are pulled to places they never imagines they would get". I'd suggest that perhaps recently something spilled into the water supply of Beitar, but this is really just taking the general rules of the general haredi community one level further. Old technology, new technology, does not matter. They should still be banning cameras, tape recorders, cars and buses. I don't remember hearing so much racist and discriminatory talk from anyone in many years as much as we have heard ever since Aryeh Deri returned to politics. According to HaRav Ovadiah Yosef, the election campaign of SHAS pushes off learnign Torah - while army service does not. Rav Ovadiah's calls for yeshiva students to leave torah learning aside and assist in the campaign for SHAS - is outrageous. They are constantly boasting that torah learning is more important pushes off everything else, including army service, but suddenly distributing amulets on behalf of the ethnic campaign of is suddenyl more important. -- Boaz Nul, head of the "Maavak HaFreierim" - the fight of the suckers (group working towards equality in sharing the burden of army service) - in response to Rav Ovadiah's statements last night that even yeshiva students and avreichim must stop learning and join the campaign going house to house to get the votes. Rav Ovadiah said SHAS needs every vote so they can grow to 15 seats and thus be able to dictate to Netanyahu and get an important ministry, and to make it impossible for Netanyahu to establish his coalition without SHAS..
Nul's response is on target, and it was my initial response as well, when I first heard Rav Ovadiah's statement. However, it is not really a good working argument, because one could argue that it is worth temporarily stopping Torah study so as to make the future possibility of study even better - by helping SHAS become a stronger party. Though theoretically one could also say that about army service, it is not quite as direct an affect. I saw an article referenced in one of the local Bet Shemesh papers over the weekend, and went looking for it to see the source. It turns out the reference was true to the original, and it has a couple of interesting points worth pointing out. Mayor of Bet Shemesh Moshe Abutbol is fairly well-liked by large sections of Bet Shemesh, especially as a person if not as a politician. Abubtol is a congenial fellow and people like him in turn. I don't know if this is the beginning of a crack in Abutbol's political standing, if he will repair the damage by making changes to his leadership style, or if the issue will be brushed away for the sake of control and power. According to the report, Abutbol has been coming under increasing criticism from his coalition members, along with from city residents, about his frequent travels abroad. They point out that in the pas two months, Abutbol has traveled to three different countries and has hardly been in Bet Shemesh. The critics add that Abutbol did not even return from a trip abroad during the military operation Pillar of Defense. The main problem they have with Abutbol's frequent travels is that the city is falling into disrepair. There is no investment in improving the appearance of the city, in its cleanliness and maintenance. An anonymous haredi city councilman is quoted as saying that many of the city councilmen think that the mayor is a wonderful person, but you cannot run a city simply by being a nice guy and well-liked. He says that the only reason the city is functioning at all is because the people around the mayor are people of action. Abutbol defended himself by pointing to the awards he has won in the past couple of years, and will be winning this year as well according to a recent announcement, for proper management. He points to this as his accomplishment despite the fact that 30% of the prize money each of those years was withheld due to poor management (specifically lack of enforcement). I am not sure how this works - the Ministry of Interior awards him prizes every year for good management and then withholds part of the prize due to poor management - but that is what has happened. Abutbol claims that the complaints are insignificant and are purely political, made by secular opponents frustrated that they have been unable to find a suitable candidate to run against him in the upcoming elections. The second point in the article worth mentioning is that Abutbol says he is considering raising the arnona payments. He is aware that the city is not keeping up with the level of cleanliness it requires, but says the city cannot afford to hire the number of workers that is required to add to the workforce to keep the city clean. His only option is to either raise arnona or look for alternative funding. I am no financial wizard and I am not familiar with the city budget, but one thing I do see them spending a lot of money on is activities during the holidays. The city subsidies trips around the country to graves, to water and amusement parks, plays, performances and films (in the city) among other things. This too (some of it at least) is important under the banner of culture. However, if the city cannot afford to clean the streets, in my opinion that is more important than subsidizing the entrance fee to plays and amusement parks. The culture budget, or whatever they call it, should perhaps be lessened and the money should be transferred to the city department for improving the city appearance. Culture should be promoted, but at less priority than cleanliness. And, there should perhaps be a debate as to what types of cultural events should be worthy of municipal support. The recent initiative to promote the arts - artist, painters, musicians, etc. - sounds like a worthy cultural investment to me, for example, but subsidizing entrance fees so kids can watch films or get buses to amusement parks at cheaper rates does not seem like it deserves the same priority. City cleanliness and maintenance should have much higher priority than events like those. It has gotten so bad that someone has even started a website to publicize, in the hopes hat such publicity will increase the pressure on the city leadership, the problems in cleanliness and lack of maintenance around the city, specifically in the newer neighborhood of RBS that already pays a higher rate of arnona. Shas has now taken the fight to the next level. Again, fighting now about division of the spoils seems premature to me, but this is what Shas and the Likud are doing. Lieberman's voice and singing is even worse than mine! And that is saying a lot! This video was on Balad's website, and it stars right-wing politicians, such as Aryeh Eldad, Michael Ben-Ari, Danny Danon, Ofer Akunis and Avigdor Lieberman as the star all singing Hatikvah to a Middle-Eastern tune... suggesting that Balad, the Arab party with Hanan Zoabi as an MK, is the only party that will prevent these MKs from turning the country even more nationalist.. It sometimes happens that I focus on one issue that bothers me or even gets me heated up at the municipal level, then a news item so sensational lands on us that it requires our attention. So this week I planned to write about the issue of selective enforcement signage in fees and other related business license, then the State Comptroller released a report on the conduct of the City Engineering Division, a report that is so bad I do not know why they are not demanding the resignation of all involved. Planning: Along with the planning of residential areas, there was no planning of accompanying industrial and commercial areas. For many of us these defects are known issues, but when you read about them in a government report, the level of the severity is more impressive. The Interior Ministry stated that the Beit Shemesh municipality filled the conditions in 2009 and 2010 and merited the award for proper management. However, because the national unit for supervision of the Interior Ministry stated in it's opinion that enforcement of the laws regarding planning and building in Beit Shemesh is very poor, the INterior Ministry withheld the 1/3 of the monetary prize that was awarded to the City. The defects were not fixed, not in 2009 and not in 2010 - so the City of Bet Shemesh did not receive the outstanding balance of the withheld prize. Regardless of the trend behind the desire to give the prize to Bet Shemesh, and I leave judgement to the reader's opinion, it is clear that the money could have been used to enrich the quality of life of city residents, if it would have been received and directed to a good cause. So, indifference to the law caused not just suffering to the residents who are forced to live in the shadow of illegal construction that is often invasive, and sometimes ugly, but also lost more money that could have contributed to their lives. The report goes on and surveys more amazing incidents and I would be happy to send it by e-mail any resident that desires it. In the Haredi press of Beit Shemesh they attributed the deficienciesof the engineering department and in the functioning of the mayor to his compassion and his lack of desire to "hurt" building offenders that might absorb heavy financial penalties. This argument shows a fundamental misunderstanding of the role of public representatives.The "merciful" in this case is actually being cruel to other law-abiding residents who are forced to live alongside the offenses. Moreover, it is not the mayor's duty to be "merciful" or nice. His duty is to promote the quality of life of residents and to guard our rights, as residents of the city, when they are facing the danger of unethical planners or contractors hungry for profit or greedy neighbors who "steal" areas that do not belong to them and thereby hurt those around them. In summary, it does not matter if the cause of the shlumialiyut, the clumsiness and lack of performance is a deficient policy of out of pity or greed, the result is the same. The city suffers from a lack of public spaces as a result of a deficient policy of distribution, shortages in areas for commerce as a result of poor planning, a deficiency of green areas as a result of greed of contractors and of the dysfunction of the Local Committee to prevent the giving of permits for plans that are not good for the public. And it does not seem that there will be a process of coming to conclusions. Many frum neighborhoods around Israel, and in other heimishe communities around the world, have a designated Shabbos Goy. Legends are formed around such people, and there are always interesting stories. There are the stories of how they helped people who were desperate, there are the stories of how they dealt with appropriate payment, there are stories of how the neighborhood treated the Shabbos Goy and what working conditions they gave him, there are stories of how the non-Jew turned out actually be a Jew, and now there are stories of what else the non-Jew was doing while he was working as the Shabbos Goy. According to a Ynet (and subsequently Kikar is also reporting it) report, a Palestinian man living in Bnei Braq employed as a Shabbos Goy was arrested for taking advantage sexually of young (in the range of 14 years old) yeshiva boys after gaining their trust and confidence by giving them money. This fellow has been living in Bnei Braq and working in this capacity for 20 years already. The investigation has been ongoing secretly for a while, but has now been revealed upon his arrest. Don't think the Shabbos Goy is your friend, just because he turns on your lights that went out. Was Arial Attias a good Housing Minister? I don't know, objectively speaking, if Ariel Attias did a good job as Housing Minister. I like Attias because I saw him working and getting projects off the ground, in a ministry that has been stagnant for a long enough time. Objectively, I have no idea if the work he did, the decisions made, the reforms introduced, were good or not for the country and the housing market. I know he got a lot of housing projects around the country off the ground. I know that a majority of those have been for his own sector, for haredi housing. However, the haredi market had probably the most serious shortage of [affordable] housing of any sector, so at least Attias made a big dent in that problem, even if the accusation of him working only for his own sector is true. Interestingly, and unfortunately it comes with no explanation, Globes is reporting on a survey taken of kablanim regarding whom they would prefer to be Minister of Housing in the next government. The results are a bit surprising because Ariel Attias came out with a very poor showing, garnering only 15% of the kablanim behind him as next Housing Minister. Unfortunately, there was no explanation as to why he had so little support among kablanim. I mean, if Attias really did increase the amount of housing projects and thereby gave a lot of business to a lot of kablanim, I would have thought the kablanim would love Arial Attias as Housing Minister. but they don't. Just as surprising as the lack of support for Ariel Attias is the overwhelming support for Silvan Shalom as next Minister of Housing, with 54% of kablanim pointing to him as the preferred minister. The level of support for Shalom is surprising, not because Shalom is not a good guy or a good minister, but because he has never filled this specific position in the past and how do th ekablanim know what he would do in this ministerial position?! Some, Shas supporters, are pointing to Ariel Attias and saying he did a good job in the Ministry of Communications, and then the Likud sent in Moshe Kachlon after him and he reaped the benefits, and extended them, of the reforms begun by Attias. And, they say regarding the current spat over who will control the Housing Ministry in the next government, the same will happen in this ministry - Attias has done a good job of implementing reforms and increasing the amount of new projects, while the Likud will then come in and reap the benefits in the next government. Likud people, on the other hand, are saying that Attias worked very sectoraly, building only for his own sector, not even doing a very good job of it, and like in the Communications Ministry they will now have to send in a Likud minister to take it over and clean up Attias's mess. I don't know which perspective is objectively correct. In the school basketball league, religion trumped basketball yesterday. In a match between Elitzur Ranaana's team, and Alfei Menashe's team, the Ranaana team protested that a girl was on the Alfei menashe team. As soon as the cosh saw that a girl was on the team, he went over to the referees and told them his team cannot play, because there are some religious boys on the team and they are not allowed to touch the girl - they are shomer negiah. After some discussion and debate, the game was canceled, with Ranaana's team being declared the technical winner of the game, after Alfei Menashe refused to play under proposed conditions. I don't know if the demand was right or wrong, appropriate or inappropriate, considering the circumstances (i.e. these religious boys are participating in a league that allows girls to be on the teams - if they have a problem, they shouldn't play in this league, or make demands of others, perhaps something like this should be taken care of in advance and not on the court at gametime, consider the age of the kids, etc.). I don't know. I can't fault these kids for wanting to keep halacha, but if playing in this league doesn't allow them to, and they know this in advance, maybe they should not play in this league but find a different one - but I am not sure hurting the feelings of other people, or preventing other people from enjoying their same right to play, is the correct way to go.. Either way, I do not understand why Ranaana was declared the winner of the game with Alfei Menashe being the forfeiting team. Alfei came to play, under the terms and conditions set by the league. Even though they did not accept Ranaana's conditions, it was really Ranaana forfeiting the game, as they were not willing to play with Alfei Menashe sporting a female player. It is all nice and wonderful to have ideals and to stand up for them, but part of that is also respectably paying the price for such ideals. Many athletes throughout history could not play baseball or other sports professionally, due to the issue of Shabbos observance. Those who were concerned about the issue, those who stood strong on their ideals of Shabbos observance, were also willing to pay the price - they did not play professional ball. These kids are wonderful, but other people should not have to pay the price for these kids standing up for their ideals. They should find, or create, an all-male league to play in, and in the meantime, they should be taking the losses in such games.. I was asked to post the following information as a public service announcement, as there seems to still be some confusion. The renovations of the Lachish mikva have been completed and the mikva is now operational. The Dolev mikva is now completely under the auspices of Rav Spektor and the local Rabbanut, and it's operation is in accordance with the decisions and customs of the Rabbanut. The Lachish mikva is under joint supervision of Rav Spektor and the local haredi rabbonim (led by Rav Davidovitch) and it's operation is in accordance with the decisions and customs of the local haredi rabbonim. I am told that people are not necessarily aware of which customs are being followed/enforced in which mikva, and are going to the "wrong" mikva. The mikva ladies, I am told, are being very considerate and when asked are directing women to the correct mikvas. Even if a woman paid in one mikva and then discovered she is in the wrong mikva, she is not asked to pay again when arriving at the other mikva. If I understand correctly, the money from both mikvaot is controlled by the local Rabbanut, or religious council, and is really the same "pot", and the sensitivity and behavior is in accordance with how it should be running. I find the heated tones on both sides of this argument to be silly - everybody knows that few election statements are serious, but are mostly for posturing. Especially in a parliamentary government system, after the elections everything is up for haggling and everything is on the table. Maybe Likud will be willing to give it up to get something else, or maybe Shas will be offered something more attractive and will give it up. Maybe Shas will come out of the elections very powerful and Likud wont be able to refuse their demand, or maybe they will come out weak and won't be able to make such a demand.. Turning these statements into a point of friction between the parties is completely unnecessary and is even a distraction. They are dividing up the spoils before the war has been won. Bayit Yehudi did a really good job with this video that they call "Naftali Bennett's stability initiative - Doing what's good for Israel"..
Otzma l'Yisrael's jingle. cute rap with a good message, but too much motion in the video. it gave mea headache to watch. 7. Has it really rained enough? If I was in [Bennet]'s place, I would give him some good advice - I would have asked Nissim Mishal "would you refuse orders if you were commended to evacuate an Arab village? Tell me now - would you refuse such orders?" Amos Oz said that that would be the say of refusal of orders - the day when the transfer would happen. .. Nobody attacks him when he talks about refusing orders.. I personally eschew any form of Jewish celebration or enjoyment in non-Jewish religious holidays. I really eschew any involvement in non-Jewish religious events or locations. Meaning, I will not visit churches or mosques, or the like, I will not reminisce about all the great and emotional Christmas music I might have heard on the radio growing up in the USA, or the shows and culture I might have seen on television and movies growing up in the USA. I will not reminisce about the lights and trees and nativity scenes I used to see on neighbors lawns and miss oh so terribly . My form of Jewish pride is pride in being Jewish and not looking to the non-Jewish holidays and culture to make me feel good. That is for them, and this is for us. I admit, I am sure my lifestyle includes plenty of non-Jewish culture that I ingested as a child in America, but I will not spend time and energy pining for their religious holidays and surrounding culture. This introduction to the post is more than just a comment on the report that will be below. It is also a rejection of the common trend I have seen in the past few years, but much more so this year, of Jews, even frum Jews, posting on Facebook and Twitter and other places, about how much they miss the holidays, or they post their Christmas memories, or what they miss most about Christmas now that they are in Israel, etc. Chrsitmas is out of bounds for me - not because I ban it, but because as a Jew I don't see Christmas, or other religious holidays and church culture, as being relevant to me, even if as a young man and child I did enjoy the tv shows or music of the holiday. That is also true of the following report on bechadrei. The Beit Jimal monastery held Christmas services last night. it seems there was a significant group of Jewish spectators, mostly out of curiosity I imagine, from Bet Shemesh. Among the group of spectators were also religious and even haredi people. According to the report, these frum spectators in a church at a religious holiday service, were shocked, SHOCKED, to suddenly hear as part of the service, a popular Jewish religious song. The song they heard sung by the nuns of Beit Jimal was the song "Avinu Av HaRachaman" written about 30 years ago by R' Chaim Bennet for the Seret-Vishnitz rebbe. If you listen to the song in the video below (decide for yourself on kol isha relevance), you will notice that they sang a beautiful rendition of the song, but they garbled some of the words - specifically every time it mentions "Torah"
אבינו אב הרחמן של ר' חיים בנט במיסת חג המולד בבית גמאל from bhol on Vimeo. The article expresses the shock and anger of these spectators, and eventually of the original composer after he was told of what was witnessed, that this song written by a God-fearing Jew for holy purposes could be used by the church in this way, sung by nuns for their own holy day. Bennet himself, the composer, sounded hurt when he heard how his song was being used. I am not sure why the issue being made is of the church using a Jewish song in their services, albeit with slight changes. The real issue should be is why Jews, even frum Jews, are going to a non-Jewish religious service in a church. They claim curiosity, even knowing it is prohibited, is what drew them to attend the services. It seems to me that religious Jews going to a church on a religious holiday for services is much more shocking and troubling than nuns singing a Jewish song. And furthermore, to the reported issue itself, should it really be shocking that they used one of our songs? Does it affect the holiness or spirituality of the original music (if there is any) just because someone else chose to sing it? Is there really any reason to care what they sing? And looking at it objectively, we do exactly the same thing so often - how many Jewish songs were originally non-Jewish songs? How many Polish marches were converted into hassidic nigunim? Is it ok to take their music for our needs, but not for them to take our music for their needs? The entire episode is shocking, but more so that frum Jews are actively involving themselves in celebrations of a Christian holiday. Shas: we are the mezuza of the government..
Likud: When Netanyahu Speaks, the world listens..
One day this week it was announced the opening of a new college program to teach engineering for Haredim. The first engineering degree program in Israel designed specifically for haredi students was set to open on Monday at the Sami Shamoon College of Engineering (SCE) in Ashdod. The college is launching a five-year degree program in civil and software engineering, which has been tailor-made for the lifestyle requirements of its 100 ultra-Orthodox participants. Three years ago, the college, which also has a campus in Beersheba, began a pilot program for haredi students in Ashdod, including a 15- month pre-college course designed to bring the students up to the required standards in math, physics, English and Hebrew. The majority of haredi high schools for boys do not teach any core curriculum subjects, so haredi men seeking to enter institutions of higher education often have to complete these kinds of pre-college courses. The preparatory course started with more than 30 participants, all of them men, but only 17 finished for various reasons. Of those 17, only 11 decided to embark on the engineering course itself, again for different reasons, but partly because the college was not able to create separate classes for the haredi students because of the low number of participants. But once the pilot program with the remaining students was progressing smoothly, Dr.
Avshalom Danoch, the head of academic administration at the SCE, encouraged the college to roll out a full-fledged program for the haredi students. He explained that one of the general goals of the college was to broaden access to engineering degrees for sectors of society without such opportunities, and that one of the groups that the college believed would benefit and be interested in engineering was the haredi population. “We’re helping these members of the haredi community to enter a prestigious profession, and this is good for them and for the Jewish people in general,” Danoch said. The new degree program, comprising 70 men and 30 women, provides monthly stipends for the participating students totaling NIS 30,000 a year per student, which is paid for by the Halamish NGO, directed by businessman and industrialist Eitan Wertheimer. The haredi track will be separated by gender, with the classes for the women taking place in the 8 a.m. to 3 p.m.
time slot, and the classes for men scheduled between 3 and 8 p.m. According to Danoch, this time frame was agreed upon since it allows any married women students with children to drop them off at school before their classes begin and pick them up afterwards, while men can study in yeshiva in the morning and attend their university classes in the afternoon and evening. Additionally, no male lecturers will teach the female students, and no female lecturers will teach the men. The haredi program will also be taught in a dedicated building on campus, separate from the college’s other students. The five-year degree includes the year of preparatory classes taken by the pilotcourse students, and was formally approved by the leading rabbis of the Gur community in Ashdod. According to Danoch, two-thirds of the haredi students are Ashkenazi, and one-third Sephardi. Of the Ashkenazim, the overwhelming majority are hassidim, as opposed to the non-hassidic “Lithuanian” haredim. In addition to students from Ashdod, participants in the new course will come from Bnei Brak, Kfar Chabad, Ashkelon, Rehovot and beyond. Shmuel, 28, is one of the students from the original pilot course. A Gur hassid, married with two children, he served in the civilian service program, an alternative to military service for haredi men, before beginning his studies. For Shmuel, continuing with the course involved challenges to his strict haredi lifestyle that will not be faced by students beginning today. Because the size of the pilot group was so small, the college could not hold separate classes for them so they had to study in the regular classes with the rest of the students. This meant that Shmuel had to share a class with female students, something that one or two of the haredim who started the preparatory course were not prepared to do and that caused them to leave the engineering program. However, Shmuel was not ready to sit in classes with female teachers, so Danoch helped arrange for him and others a system in which a male student from the general student body would help him learn material from classes taught by women. Because the new program will be big enough for dedicated classes and schedules, these are not issues that the new haredi students will face. For Shmuel, who is also an ordained rabbi, studying for an academic degree is something he feels he has to do to support himself and his family, rather than something he’s particularly excited or even proud about doing. And even once he completes the degree and graduates, he says he would still prefer to work part-time in the morning and study in yeshiva in the afternoon. I think this, and other programs like it, is great. These are working solutions that help people who want or need to leave the yeshiva world, to become educated, learn a trade and give themselves the ability to support themselves and be productive. We need more such programs, in a variety of fields and industries. The next day, seemingly unconnected, Bechadrei reports on a group of yeshiva students from Paris France who recently came to Israel for vacation. This group of 18 year olds seems to be divided as to their futures - some are preparing to enter university, while others in the group wish to continue learning Torah. The organizer of the group decided to take these young men into Rav Shteinman to hear his opinion. Rav Shteinman said that as long as it is possible, one should stay in the tent of Torah and not leave. By doing that they would merit becoming bnei torah and talmidei chachomim. I would not expect Rav Shteinman, or any haredi rav, to say anything less than that, but at the same time he is clearly not extreme in his opinion - he leaves the door open for other pursuits when they should become necessary, while preferring the pursuit of Torah as long as it is possible. I wish Mr. Tal the best of luck, both in getting enough voters to decide to vote him in at the 13th spot on Tzippi Livni's party list, and in trying to gather an egalitarian minyan to daven together in the Knesset shul. I expect they'd have a very excited minyan the first morning for shacharis, but by mincha time nobody would return. And shacharis of the 2nd day will also probably be pretty empty. In case Israeli roads weren't dangerous enough already, the Ministry of Transportation has now announced that it will finally be implementing a decision, that was approved two years ago, to raise the speed limit on certain roads around the country. Kvish 6, the cross-country toll road, is having it's speed limit increased from 110 kmph to 120kmph, though with the official policy of not enforcing speed violations until more than 10% of the limit has been violated, that makes the effective speed limit being 130 kmph. It is not quite the 140kmph Amnon Yitzchak wants the speed limit to be, but he seems to already be having an affect on the Israeli public sphere! Highway 1. Along certain portions of the road, the limit is being raised from 100kmph to 110kmph, with the effective limit being 120kmph. The section of road on which the speed limit will be increased are: between Ganot and Shaar Ha'Gay junctions. Highway 2, aka the Coastal Road. Certain sections of the road will have their speed limts increased from 100kmph to 110kmph. Other roads that will be adjusted are roads 40, 77 and 471. According to the Globes report, the changes will be in effect in the near future. New signs need to be installed instructing of the changes. So either get ready to drive faster, or get ready to avoid even crazier drivers! This Nach Nach party really cracks me up! Rabbi Amnon Yitzchak or haRav Amnon Yitzchak? A number of years ago there was a big debate over foreign college credits and degrees. the debate was whether the Israeli Ministry of Education recognizes certain foreign degrees, or college credits, and how they should be looked at and integrated into Israel. I remember the big problem was that if an undergraduate degree was achieved by using credits that Israel does not accept, or in a college/university that Israel does not recognize, then even if one had an acceptable graduate degree, or higher, that too would be rejected, because one cannot have a graduate degree without first having an undergrad degree! 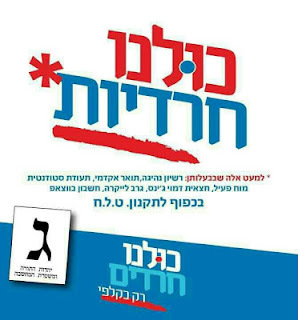 Who would have thought that an election ticket could generate a similar discussion, but regarding usage of the title "haRav". The big question raised and discussed in the media and by the election board was the validity of calling Rav Amnon Yitzchak by the title "Rav". One would think he was running for the position of Chief Rabbi rather than simply being the guidance of and leadership behind a political party. His title is irrelevant in this situation. The issue needed to be checked, and eventually it was made into an official decision. The title haRav could not be used by Amnon Yitzchak, because he has not received smicha. The election ballot is an official document of the State of Israel, and titles can only be used on them if they can be backed up with documentation. The official ballot will now say "Koach l'Hashpia, under the leadership of Rabbi Amnon Yitzchak". Interestingly, Rav Amnon Yitzchak himself, until his request to use the title on the ballot, spoke proudly of how he does not have smicha and is not an official rav, and has even considered use of such a title to be degrading and a sign of personal interest and profit rather than of spiritual pursuits. He has said so in many of his speeches, and one can easily find an explanation on the website of "the rav's fan club" which is linked to from Rav Amnon Yitzchak's own site. In the FAQ section of the website, the one and only question displayed is if Amnon Yitzchak is a rav. In the author's answer, he takes pride in the answer being negative, he says haRav Amnon Yitzchak is much greater than just a rav. There are all types of rabbis, just like there are all kinds of doctors. Anybody can become a rav, after just some months or no more than a year of studying, with the most common type of rav being someone certified as a mohel or shochet or a wedding rabbi. Often someone with the title of rav has only expertise in one niche of Torah but does not know much from the other sections of the Torah. Whereas, Rav Amnon Yitzchak, he continues, is an expert in all sections fo the Torah. there is not a wuestion he cannot answer. Also, Rav Shach did not have smicha from the Rabbanut yet he was the Ashkenazi gadol haDor, and all the ashkenazim listened to his psak and learned his Torah..
Getting smicha from the Rabbanut,he continues, is only for the purpose of someone getting a parnassa, while Rav Amnon Yitzchak never planned on getting a parnassa form his Torah, so he never bothered to get the smicha from the Rabbanut. He does not take the issue seriously because as he is such a talmid chochom that if he wanted one he would simply call the chief rabbi and ask him to print out a certificate for him. In response to the issue above, of trying to get the title included in the ballot but the request being rejected, he derides the title even more saying everyone knows how the title haRav is the lowest possible title one can have... for many years they derided Rav Amnon saying he isn't a rav, but suddenly they forced upon him the title of "Rabbi" which is a much greater title than haRav, similar to Rabbi Akiva and Rabbi Shimon bar Yochai. Eventually he will even be given the even greater title of "Rabban". 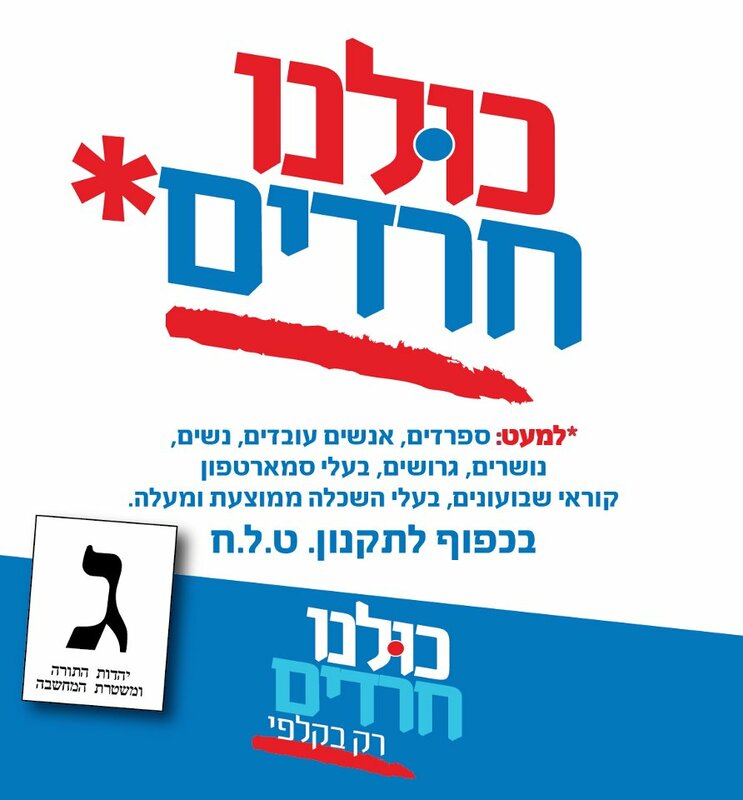 As I have said, Rav Amnon Yitzchak and his party are definitely one of the more colorful aspects of this election season. Moshe Grylak's editorials in Mishpacha magazine are generally one of the best features of the magazine. Even if I don't have time to read the magazine, I will always try to make time to read his editorial column. Not that I always agree with everything he says, but I always enjoy reading what he has to say. This past week I just didn't understand Grylak. In one of his smaller editorial spots this past week, Grylak stuck his neck into the ongoing fight between the Yated faction and the "HaPeles" faction, which has now become the "Netzach" political party faction opposing Degel haTorah, of Litvishe haredim that has been percolating over the past 6-8 weeks. Until now he has been pretty silent about it, but now he had to comment on something the "Netzach" spokesman said recently. Netzach spokesman Yaakov Friedman recently commented, to the media, after the meeting last week between Rav Shmuel Auerbach and Rav Shteinman, that "Bnei Braq will burn, blood will be spilled". Grylak criticized Friedman, rightfully so as what Friedman said was very inappropriate, but he criticized him with scorn. Grylak wrote "Blood will spill? that's what the head of the Ashdod faction said when he wanted to describe to the secular media what will happen in unity does not return to the Litvishe community in accordance with the conditions that he sets. Blood will spill! Bnei Braq will tremble!... Without sticking our heads into the argument over nothing being led by a fired journalist, what is this type of speech? what is this - the Black Panthers? Harlem? Hamas?.. " The Netzach-Peles faction calls themselves the "Jerusalem faction" of the haredi community, led by Rav Shmuel Auerbach, in contrast to the Bnei Braq faction led by Rav Shteinman. Calling them the "Ashdod faction" is scorn rather than criticism for the statement, considering them even smaller and worth-less than how they consider themselves. No doubt they deserve the criticism, and haredi insiders should be fuming at them for that aspect of the disunity they are affecting. Though the truth is that Degel, the original Litvishe faction seems to be fighting with everyone - the Jerusalem faction of Litvaks, the hassidim, Shomrei Emunim... so maybe Degel is being too obstinate and responsible for much of the fighting. I don't know. I am not looking to decide who is at fault, but whoever is at fault, causing a split is pretty serious for what is already a small political party that has a lot to lose. So no doubt they deserve to be criticized, both for their part in the disunity and specifically for that incendiary statement made by Friedman. However, Grylak? Is Grylak really the right person for this task? Even though he was one of the founders of the Yated many moons ago, more recently he himself was the target of a vicious campaign led by the Yated. Yated led a relentless attack against the Mishpacha magazine and it's leadership, with letters signed by gedolim and rabbonim against Mishpacha, pashkevilim, editorials in the Yated about how bad Mishpacha is with no daas torah and the like.. and now Grylak is doing more than criticizing Friedman's statement, he is just about taking the side of the Yated. this made me chuckle. The irony of a gay magazine selecting Eli Yishai as one of the hottest guys is just too much. Another strange thing about this is Labor leader Shelly Yachimovitch, a female, making the list as well. They want to take away the last valuable thing we have. What didn't the Housing Minister do? Not just for Sefardim, but also for Ashkenazim. There were always Housing Ministers who did nothing. They would sit at home and smoke nargila. What did our Housing Minister do? Day and night he worked to build neighborhoods. A hidden camera exposes what really goes on with the kosher phones and why/how they are more expensive than regular cellphones even though they offer less..
interesting to see the differences in formality between the US troops and the Israeli troops. The US troops are wearing real dress uniforms, with gloves, while the Israelis look kind of messy and disheveled and scrungy in ill-fitting uniforms. Also, note the difference - the US female troops are wearing uniforms with skirts, while the Israeli females are not. As reported on Bechadrei (you can hear the audio clip there) an avreich went to Rav Shteinman with a dilemma. He has voted UTJ in all the elections since he became frum, but many years ago Rav Amnon Yitzchak brought him to becoming a baal tshuva. Now that Rav Amnon Yitzchak is running his own party, maybe he has an obligation out of gratitude to Rav Yitzchak to vote for Rav Yitzchak's party? Rav Shteinman's answer, after everything was translated to and from Yiddish, was that A person should have more gratitude to Hashem. Meaning, you should gratitude to Hashem by voting UTJ and that is more important than the gratitude to Rav Yitzchak. I would note that this is consistent with the brouhaha over Rav Shteinman giving Rav Amnon the go-ahead to open his own political party, and when confronted the explanation given was that because his party is not targeting voters from the traditional haredi parties but is looking to bite into the votes from secular paties then it is ok to open the new party. Will Immodestly-clad Women at the Kotel soon be arrested? On June 27, 1967, a couple of weeks after the conclusion of the Six Day War, a law was passed to protect the holy sites in Israel. A number of holy sites had just been recovered in the war, and they needed legislation to ensure the freedom of access to them, as well as to protect their holiness and sanctity. The original law was fairly vague in detail, but it did punish the offender with imprisonment for anyone who desecrates or damages the holy site, or for anyone who impedes free access to anyone from any of the religions, to the place that is holy to them. In 1981 the Minister of Religious Affairs amended the law, detailing specifically which sites around the country are included and protected by the law under the title of 'holy sites'. In addition to defining which sites were considered holy sites to be protected by the law, it also defined certain activities that would be considered damaging/desecrating to the holy site. (ב) ברחבת הכותל המערבי לא יחול איסור העישון בימי חול אלא באזור הסמוך לכותל המערבי; באזור הסמוך לדרך המוליכה לשער האשפות יחולו האיסורים שבפסקאות (1) עד (3) ו-(7) בלבד. Interestingly, as a side point due to the recent uproar over the arrest of Women of the wall for bringing their tallitot to the Kotel (even prior to actually wearing them, in 2001 there was an attempt to add another amendment to the law and include holding any religious ceremonies that include taking a sefer torah, donning tefillin and/or tallit, and blowing shofar, on the women's side of the divider. This amendment was not passed. That does not mean women by law should be allowed to wear tallit at the Kotel as it is not defined as an act that is prohibited, because in the list above under the section (1a) it would be prohibited, albeit less explicitly, under the category of holding a religious ceremony not in accordance with the traditions and customs of the place. #2 above is the one that is under discussion. #2 states that inappropriate dress is considered desecration of the holy site. According to news reports, this organization, Tohar HaMachaneh, has sent a letter to Rabbi Shmuel Rabinovitz, chief rabbi of the holy sites and the ultimate authority on enforcing the law of the protection of the holy sites, demanding that he enforce the law in regards to the immodest dress found all too common at the Kotel. In their letter sent by their lawyer they point out that this is even punishable by imprisonment. It truly is a problem, and I do not know what the correct solution is. I am pretty sure that giving control to these creeps is not the solution. On the one hand we want all these non-religious and/or traditional Jews from around the country to come and experience the Kotel, be a part of the heritage, be affected by it and to have it as an important place dear to them, and we want the tourists (and, let's be honest, we want their foreign currency to continue flowing as well as their sentiments to be with Israel). On the other hand, it is a holy site and should be treated appropriately. I would simply point out at this time that if Rabbi Rabinovitz is going to be pressured to enforce definition #2 regarding modesty of dress at the Kotel (and other holy sites), I imagine he should also enforce the other definitions in the list including #7 that states collecting donations is considered desecration of the site. Obviously #10 should be enforced stating that smoking is considered a desecration of the site, with the qualification that during weekdays smoking is allowed in the upper plaza and only banned in the Kotel area below. Regardless of what is the right or wrong approach to dealing with less-modest women at the Kotel (and other holy sites), they give an awful lot of money to the collectors who are there just as illegally. Tohar HaMachaneh is going to be hurting a lot of people's income by demanding Rabbi Rabinovitz begin to enforce these laws. If he doesn't do this on his own, I expect some other organizations will quickly make the demand to arrest (or just fine them or bar them from the area) the collectors in response to Tohar's demand to arrest (or just fine them or bar them from the area) the immodest women. Can Sephardim Eat Food With a Rabbanut hechsher? Can Someone Offer a Vision for Israel’s Future? Is SHAS the party of the haves or the have-nots?